Is the Duggar family preparing for baby number 20? Home » Dad » Is the Duggar family preparing for baby number 20? Reality television stars and parents Jim Bob and Michelle Duggar have 19 biological children and say that they’re ready for more. The Duggars are conservative Christians who believe in having as many children as possible. Michelle, 43, gave birth to the couple’s 19th child, daughter Josie, three months prematurely in December. She weighed less than two pounds and spent nearly six months hospitalized as she recovered from a perforated bowel and rare digestive problems. Yet, despite the medical challenges the family has faced with their premature child, 45-year old Jim Bob says they are open to doing it all again. “Our family is stronger than ever. We made it through the storm,” he told People. 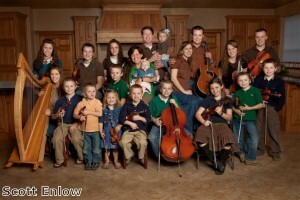 The Duggar family stars in the TLC series 19 Kids and Counting, which can be seen on Tuesday nights.